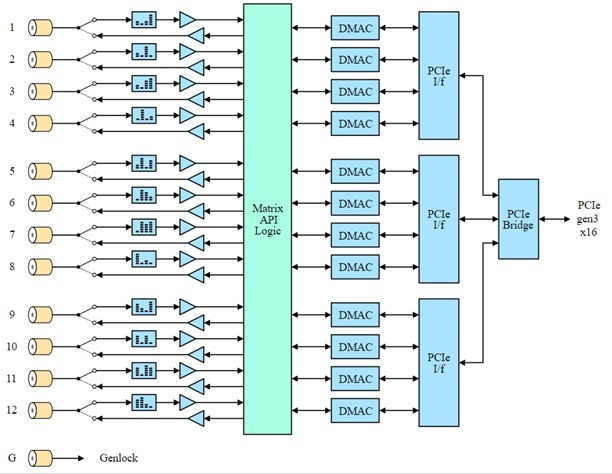 DTA-2179 - DekTec Twelve 3G-SDI/ASI ports for PCIe | AdvancedDigital Inc.
DekTec Matrix API 2.0 framework takes care of all the plumbing for creating robust real-time SDI processing applications. The Matrix-API framework decodes incoming SDI data into pixels (in a programmable format), audio samples and ANC data structures. When a new frame has been received, the framework calls a user-supplied “frame-processor callback” for processing of the data. The user callback can create output video, audio and ANC data. which is encoded by the framework into SDI frames. Synchronization of multiple input streams is straightforward: The video/audio/anc data of all SDI frames supplied to the callback function have the same arrival time by definition. Past frames can be accessed by an integer frame index. The framework ensures that if frames from different input ports have the same frame index, they have entered the system at the same time instance. 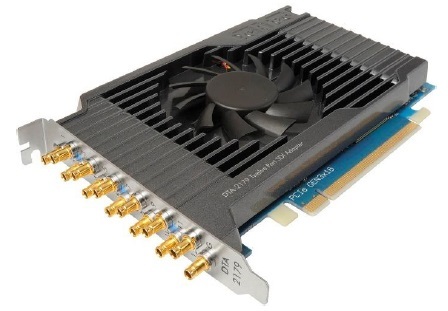 DTA-2179-SLP – Twelve 3G-SDI/ASI ports for PCIe with StreamXpert Lite and StreamXpress player software. DTA-2179-SXP – Twelve 3G-SDI/ASI ports for PCIe with StreamXpert 2.0 stream analyzer and StreamXpress player. 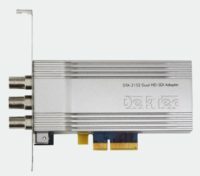 DTA-2179-SY-SXP – Twelve 3G-SDI/ASI ports for PCIe with SdEye and StreamXpert 2.0 stream analyzer and StreamXpress player. DTA-2179-VR-SY-SXP – Twelve 3G-SDI/ASI ports for PCIe with VF-Rec stream recorder, SdEye and StreamXpert 2.0 stream analyzer and StreamXpress player.